With a kickoff meeting and an excursion, the research project MISS has started. MISS means "Reduction of the interfering effects of wind turbines on seismic stations". As a project partner, our team's contribution consists of vibration measurements on wind turbines, the analysis of their dynamic properties as well as the prediction of vibration emissions at the tower base. You find here further information on the project. Our almost complete team of engineers attended the VDI Conference on 17th-18th April. We could contribute with two practical presentations to this interessant conference, where we especially appreciate the contact and exchange with others dynamicists. We thank all organisers and look forward to the next conference! At a construction site in Witten, one of the heaviest single-drum rollers (32 t) was used for deep soil compation works. Our team has performed vibration measurements within the research project EProg and also in order to ensure a low vibration level in the surrounding residential buildings. We prefer individual solutions and have recently startet to build plastic parts of our measuring equipment in-house. Our 3D Printer fabricates within a short time every casing and packaging part needed for our special measuring equipment. And what is more, it generates the right maker feeling. Our new measuring vehicle arrived in August and has proven in use since then. We upgraded our fleet and established an unique design. As a part of the Aeolus4Future Workshops we offered an onsite dynamic testing of a pedestrian steel bridge (“Erzbahnschwinge”, Bochum) which everyone truly enjoyed. The new year brings new interesting projects, for example this measurement with artificial excitation with our shaker Butterfly®. A tower building is going to oscillate in horizontal direction. 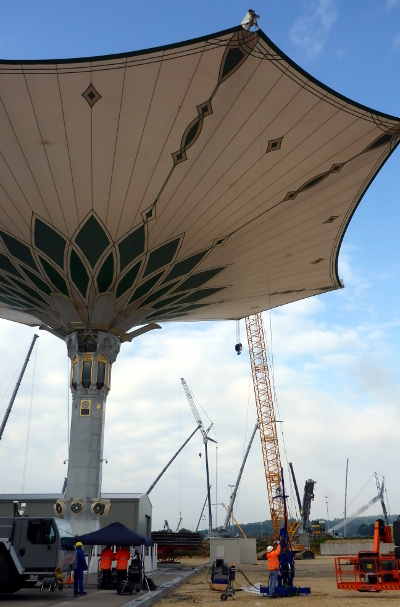 Spectacular Impressions were gained this autumn during our "sunshade" project. This technical refined construction with its extraordinary dimensions demanded great skill in full activity of our team. On Melaten Campus of RWTH Aachen University a new building for the faculty of Electrical Engineering is planned. It will include Laboratories, office rooms and a clean room, where the highly vibration sensitive laboratory equipement is to be placed. In careful consideration of the users input we developed exact vibration requirements for this specific project, which ensure the serviceability of the building in future. In our calculations we take into account external influences such as road traffic vibrations, diffuse soil vibrations due to the usage of neighbouring buildings or internal influences due to the usage of the building itself. Extensive vibration measurements on site were taken as a basis for the elaboration of the buildings dynamic conception. Shaker Butterfly® is at your disposal for soil vibration measurements. During the last year our new shaker has successfully been field-tested. The vibration effect of a planned test stand was simulated with shaker Butterfly® and measured with a 400 m vibration expansion test set-up. Since 18 years existing Ingenieurbüro Dr. Heiland is now Baudynamik Heiland & Mistler GmbH. We are glad to welcome Herrn Prof. Dr.-Ing. Dieter Heiland and our project manager for many years Dr.-Ing. Michael Mistler as our new proprietors. As usual we place our services at your disposal for any dynamic questions. As an expert of structural dynamics Prof. Heiland his team performed a unusual testing measurement. 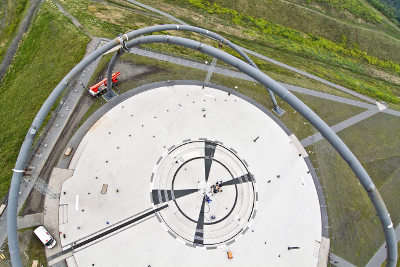 With our "hydraulic shaker Butterfly®" they induced a permanent oszillation to the steel arches of the Horizontobservatorium landmark on Halde Hoheward to gain information about the material of the well known structure that is out of order much to the regret of locals and tourists. Being a graduate of Ruhr-University Bochum it was always very important to our proprietor, Prof. Dr.-Ing. Dieter Heiland to pass his scientific knowledge and professional expertise to today's generation of RUB students. Regarding this he was awarded an adjunct professorship for his distinguished teaching at RUB. 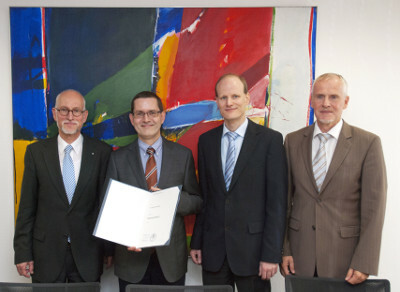 We are particularly delighted and proud to cooperate with the famous university of our city. The solemn award presentation was held on May 21, 2013 by rector Prof. Dr. Dr. h.c. Elmar W. Weiler, Prof. Dr.-Ing. habil. Peter Mark und Prof. Dr.-Ing. Martin Radenberg.